We are an event club that was formed in 1996 in support of the Tennessee Running Tour, a series of road races held in various State Parks from October to March each year. The club is a member of Road Runners Club of America. The club is headed by Tomas de Paulis, a retired chemist, as President and Secretary and by his wife, Lynda de Paulis as Treasurer and Vice President. It is currently located at 205 Woodland Court in Hermitage, TN. The club members are the race volunteers. Annual membership fee is one dollar. Currently, Frostbite Running Club organizes 8 of the 20 races in the Tennessee Running Tour. These are: Pilot Knob 10K, Halloween Hunt 5 Miles, Gobbler Gallop 6.8 Miles, Over the River 8 Miles, Trail of Tears 7 Miles, Johnsonville Charge 5 Miles, Cedars Frostbite Half Marathon, and Two Lakes 7.3 Miles. The club also organizes the Greenway Marathon and Half in Nashville, TN. 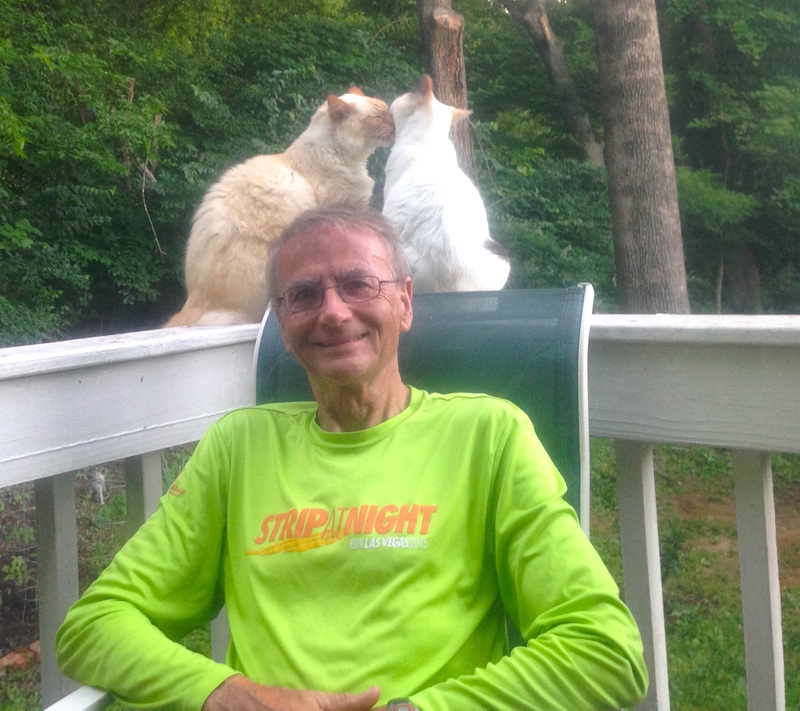 Pictured is the Club President on his back porch with Romeo and Juliet.